Not sure if this has been posted yet, seems like I'm not that daft after all. I don't think anything else really matters, there is nothing that can combat the magnitude of the trades being made. Circular investing is killing everything. According to the results of their latest triennial survey, global foreign exchange turnover rose 20% to $4trn per day on average (yes, that's each single day) in April 2010 compared with April 2007. Or to put it another way, a sum equivalent to the entire output of the global economy is traded around once a fortnight on currency markets. Well some would view these statistics as evidence that the banking industry has become more than slightly detached from the "real" economy, that many of its activities are either pure speculation, or attempts to hedge speculation, or attempts to hedge the hedges. Also, it would be pretty difficult to argue that the net effect of all this financial business has been to reduce the volatility of markets, or to improve the stability of the global economy, or to increase the growth rate of the global economy. Many might well dispute that the great banking meltdown of 2008 happened because of this explosive growth in financial trading - but the trading certainly didn't prevent the crash. And there is a massive disconnect between a global economy that has less than doubled in size over 12 years and - on the other hand - OTC derivative transactions that have increased eight fold while foreign exchange transactions have almost trebled in value. What's more, as I've pointed out before, the global economy was growing quite as fast in the 1960s when much of this financial business barely existed. So those who can't see the point of all these financial trades may (ahem) have a point - unless, that is, you believe the enrichment of financial traders and hedge fund managers is a social good in itself. Only question is, as always, who will be holding the assets and who the liabilities when the music stops. A transaction tax can do it pretty nicely. It does need to be emphasized just how economic growth in the era of financial liberalisation/privatisation (1980s on) has been slower and more haphazard than in the far more regulated 1950-70 regime. 100-1 on says it's joe average taxpayer (or his/her pension fund). Time to invest in pitchforks and torches? If things go even half as badly as it looks they might, there are going to be a lot of very angry people. 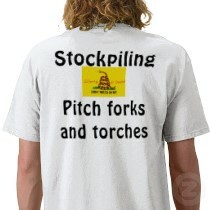 Wanna start trading in my new pitchfork and beans derivatives? Japan are buying the $ to try to debase the Yen which is crippling their exports and any hope of breaking their continuing deflation . The US are going into a double dip IMO which means they must try to spike the Euro up to remove the EZ from the competition which means the hot money is all riding the FOREX market trying to guess whether the Euro, $, Yen or Sterling are going to give the biggest returns in the SHORT TERM. Sterling rests on the housing market so any gains there short term will give rise to a steeper sell off when confidence finally goes. We have a few more months before the effects of the cuts kick in and the possibility of strikes and bad news for jobs will all impact Sterling. The bad news is pretty much all out for the $ and they are ahead of the rest of us in the cycle. I cannot see how they can avoid a double dip and that will impact the rest of the world--only later. So the currency trades are all based on short term and its a dangerous place to be. I am not touching FOREX trading myself but continue to bet against Sterling medium to long term simply becasue that is where my STM fund has been in limine. Sterling might spike up vs. the $ for the next few weeks as the "good news" is that things won't get rough until later. Dealers suggested Wednesday's intervention amounted to about 300-500 billion yen (2.3-3.9 billion pounds), though some reports put it closer to 100 billion yen.